From Stranger Things, to E.T and The Goonies, there’s something about the ’80s-kids-on-bikes-surrounded-by-weird-stuff story that is impossible to get sick of. And the comic book Paper Girls fits right into that walkie talkie-wielding, bike-riding niche of nostalgia. 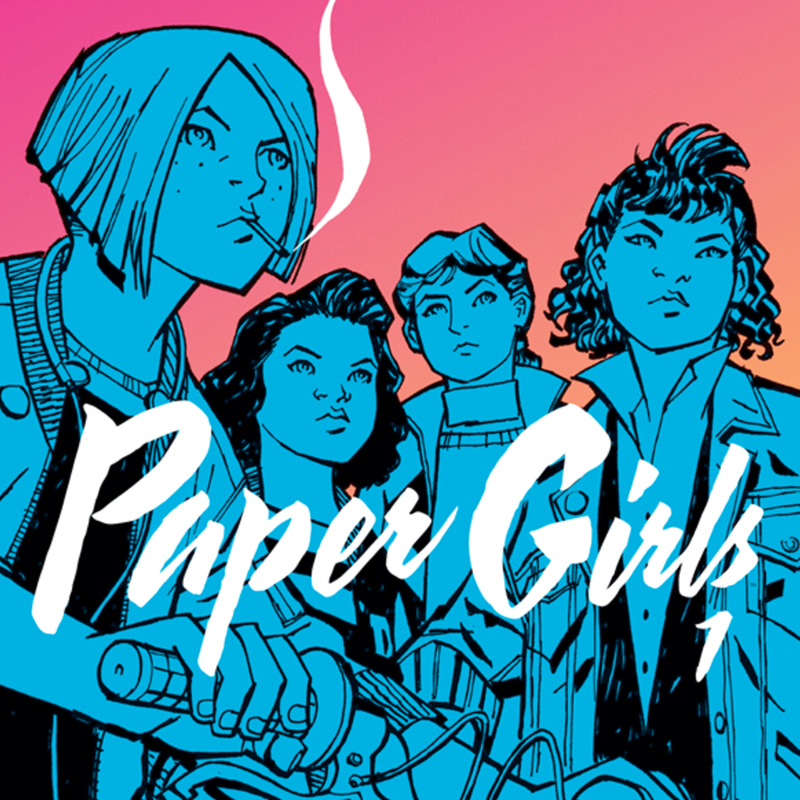 Written by Brian K. Vaughan (Saga, Y The Last Man) and illustrated by Cliff Chiang (Wonder Woman, Swamp Thing), Paper Girls follows a group of paper delivery girls in the ’80s who get way more on their paper route than they expected when most of their town disappears and they’re suddenly being chased by monsters. But nothing is as it seems in Paper Girls – it constantly surprises and throws you through a new hoop at every turn…and all with rad female main characters embarking on a similar adventure we’ve seen predominantly young men embark on. We dig Paper Girls, and we’re super excited that the artist of Paper Girls, Cliff Chiang, just launched the Paper Girls Artist Shop! We talked to Cliff about how he brings this ’80s sci-fi adventure to life through his unbeatable illustrations, his own adventure taking the leap from magazine editorial to illustration, the gender shift we’ve seen in comics lately, and what it’s like illustrating for a character as iconic as Wonder Woman. Check out what he had to say! And be sure to check out Paper Girls – it’s your next comic obsession. Were you a comic book fan before you became a comic book artist? What was your ‘gateway comic’? Yeah, I read lots as a kid. I think the first comic I fell in love with was Uncanny X-Men #172, with gorgeous drawings and effortlessly elegant storytelling by Paul Smith. In a lot of ways it set the creative tone of my career, and it’s part of my DNA at this point, consciously or not. You started off as a magazine editor – how did you get started with that part of your career? How did you transition from that to illustrator? I was always interested in comics, and wanted to work in editorial while honing my drawing skills. It was a great way to learn how comics are made from top to bottom, like grad school for me. But I realized after a couple years that I’d never be making comics unless I took a leap of faith to draw them full-time instead of after office hours. One of your newest comics, Paper Girls has been called “the next great American comic,” and your art looks like it falls in line with that, mixing modern comic book art with a classic comic book art style. Is this mixture a big part of your style? I love classic illustration from the ’60s, so sharp and modern yet organic, as well as comics from the ’60s and ’70s. I wish I had that kind of skill! We do try to emulate some of that because it’s so solid and readable, but also give it a knowing contemporary edge. I hope the book evokes the 80’s, but doesn’t necessarily look like it was drawn in the 80’s. Not that there’s anything wrong with that, but we didn’t want it to feel like an “old” comic. What attracted you to the Paper Girls story? Where did the idea for the story come from? When Brian was growing up in Cleveland, there was one year where all the paper delivery boys were actually paper girls, and he always thought that was an interesting phenomenon. Those girls were the first of their kind but also the last, because kids would soon stop delivering papers and give way to adults in trucks. I liked the story idea, especially how it allows us to be a little nostalgic as well as be wary of seeing the past with rose-tinted glasses. How did you start working with Brian K. Vaughan? Brian actually wrote one of my first gigs as an artist (Swamp Thing Secret Files). It was a great script and we both loved working with each other, but somehow our schedules never lined up. He always kept in touch though, and I really appreciated that. 15 years later we finally got the chance to collaborate, so never say never! What made you decide to open an Artist Shop for Paper Girls! Do you have a favorite design? experience of the book. Initially I was reluctant to open a shop because I wasn’t sure if I’d be able to come up with any designs, but once I started they came pretty easily. I like ’em all for different reasons, but “Eighty-Eight” (right) might be my favorite because it combines my drawing with a few visual jokes for fans of the book. You have a few different art styles in your Shop too, it mixes it up! I love designing tees, and the shirts are all nods to popular styles with a Paper Girls spin on them. Vintage athletic gear, surf graphics, concert tees, anything I can think of that would be fun and cool! We’ll be refreshing the collection periodically, to keep it exciting. The way you draw the Paper Girls characters doesn’t look like it’s trying too hard to pass for the ’80s – it’s organic and fully encapsulates the look of the time in a way that puts you right there. How did you get in the ’80s zone and bring the look to life for each of these characters? We’re not doing ’80s satire, so I want the characters to feel authentic and observed — relatable instead of broad caricatures. I was lucky enough to find my old junior high yearbook from 1988, and it brought back so many memories. It was a huge help to remember what kids looked like and wore back then. I thought of the characters as girls I would’ve gone to school with, and that helped make them real for me. You also illustrated for Wonder Woman, which is so rad! Was it daunting illustrating such an iconic character? I really grew to appreciate the symbolism of the character and how deeply the fans care, but I took it all pretty seriously from the start. Wonder Woman represents the best in all of us, and I tried to draw her in a way thatclearly showed her strength, confidence, and compassion. Paper Girls, Wonder Woman – you’ve got a pretty cool repertoire of solid female comic characters in your work load! How do you think the comic scene shifted in terms of gender representation? It’s opened up, and I think we’re getting closer to reflecting the audience, and really, the rest of the world. Comics aren’t such a niche thing anymore. Women have always read comics, but for years all we had was superheroes. Now that there are more kinds of comics out there and more people reading them, I think we have a responsibility to reflect the world we live in and all its diversity. Disney and are now freelance/illustrating at Image – have you found there’s more refreshing creative freedom working at Image? I try to put as much of myself into everything I’ve done, but it’s always a heartbreaker when you don’t creatively and financially control what you’re working on. But with Image, we’re able to call all the shots on our story, and there’s no one to tell us it’s not as good as the previous run of Paper Girls either. It’s tremendously liberating and fulfilling, and I feel very lucky. Just thanks to Threadless for such a cool way to connect with our readers! Posted in Blog, Spotlights and tagged Brian K. Vaughan, Cliff Chiang, image comics, Paper Girls, saga, wonder woman. Bookmark the permalink. Winner Interview: Everybody Loves R&men!